The most beautifully designed timeline template on the market, the Comprehensive Timeline Sheet can help you accomplish any project at no cost to you. The free template provides you with a fully customizable design that makes going in and entering your specific information fast, easy, and fun. Not only does this timeline template come with a graph that conveniently lists out every day of your project but you can also adjust the year so you can continue to use this sheet to optimize your projects for every year after. To download the free document to your computer, all you’ll need to do is click the link located at the bottom of this page. Each day of your project will be displayed on the timeline and highlight the current date. When you have an upcoming milestone on the graph, you’ll know what to prepare for. You will make your way through the entire timeline to achieve your goal. To start your timeline, you will need to enter all the required information in the table at the bottom of your screen. The first thing you need to enter is a nice title for your task. “Milestone” is a little vague so you want to have a title that captures exactly what it is you need to accomplish. After the title, you should list a start and end date for your tasks as well. You should have a good idea about these dates based on your expectations but it is a template so you can easily change it later if something changes. The last thing you will list is a note. These can be any tips, tricks, or trade secrets that might help you in a pinch. Now, when you come to a task on the timeline you will know what you need and be able to refer back to your notes for help. 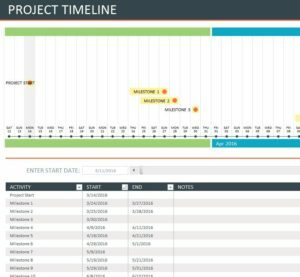 Bring order to the chaos of your projects by using the Comprehensive Timeline Sheet today.